When the word play is mentioned, I think of the joyous moments in my childhood—being outdoors on the swing or covered in mud or sand and making potions or delicious treats depending on the day. I think of the laughter, the sense of freedom, the friends, and the experiences I see unfolding every day in Pre-Primary classrooms at Lowell. Play is a vital part of our lives. It reaches its culminating point during childhood and adolescence, and as we reach adulthood, it changes characteristics and can start to disappear from our lives. Play is also a guiding force in the life of a classroom. Its powerful presence shapes the social environment. As an educator, I appreciate the importance of play and promote opportunities for play in the school where I teach. Each one of us holds positive and powerful memories connected to play so it is easy to see the importance of it. What might not be so easy to understand is the role it plays in the process of learning. Children’s brains develop as they grow, and each experience they are exposed to and engaged in helps form connections in their neurological system. Infants employ simple forms of play during the first few months of life. When the adults foster an infant’s need for interactions, they model skills that children need to initiate play for themselves. Studies show that there are negative developmental repercussions in babies and children deprived of play; these children exhibit extreme social withdrawal and a lack of understanding of social cues. Research has drawn parallels between animal play and the play in which human beings engage. The playful banter between two kittens chasing each other has rules and expectations that researchers have found are similar to young children’s play. As kittens experience the thrill of chasing they also learn how to use and regulate their strength and bite according to the responses of their playmate. Children learn by engaging in a play that becomes more complex as they grow. The simple chasing game becomes a game of hide and seek with clear, understood rules, and children learn to use their physicality in a way that does not cause harm to the other players. In early childhood classrooms, children use play materials to build, create, explore, and pretend, but most of all play is their vehicle to decode and understand their feelings, their world, and others. Children invite each other to play activities, and they learn to follow, to lead, and to observe. Friendships are formed, and bonding with one another follows unspoken natural laws that are unique to play. Play holds a central role in the healthy social development of children. Children reach milestones at different ages, and developmental guidelines help educators understand how children are moving along the continuum. The play of a two-year-old child looks very different from the play of a four-year-old child. The age of the children determines different outcomes of the play experience, or if they are building with Legos or big blocks for example, older children will make more elaborate buildings than younger children will. Children of all ages set goals for themselves as they declare they will build a tower and then proceed to create in collaboration or individually. The continuous exchange of ideas and interactions between students assist in a learning experience that is genuine and unpremeditated. Spontaneous play allows children to freely explore. 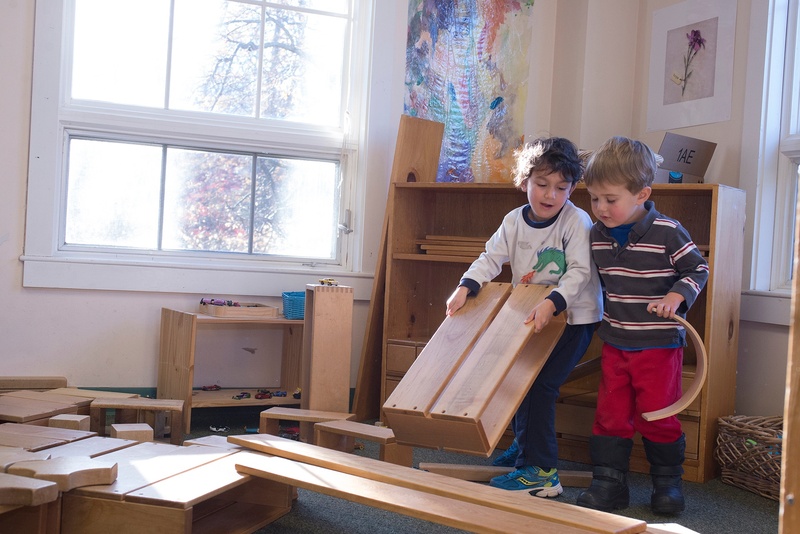 In Pre-Primary teachers observe students as they engage in spontaneous play; a world of information is given to teachers when listening to their conversations. As they build their structures with blocks they also form a mental image of what they want to construct, and this thought process helps to foster their cognitive and logic skills as well. Often in Pre-Primary you will see a teacher stand or sit close by a group of students and scan the room to see how each child is engaged in play, monitor the learning, and offer unobtrusive assistance when needed. Social play recreates and supports the understanding of cultural settings, customs, and rituals, as well. A classroom’s dramatic play area lends itself well to this purpose. Over the years that area in the Pre-Primary classrooms has transformed into a repair shop, a salon, a house, a doctor office, an office, a bakery, a Chinese restaurant, an Italian restaurant, and an airport. The children play with the artifacts from around the world or from the specific environment the area is supposed to depict, and the children are exposed to customs and traditions in a playful and approachable way. Play also helps children practice skills such as self-control and turn taking. Pre-Primary playground offers students a favorable time to explore and practice these skills. As they run around and use the play structures, children have to practice patience and turn taking. When the slide is not available and they have to wait, they also fight the urge to push the friend down the slide. They internalize the concepts of waiting, patience, and order by experiencing the interactions between cause and effect. Pushing a friend who is not prepared for the descent down the slide might result in a tearful playmate or even a loss of playtime. 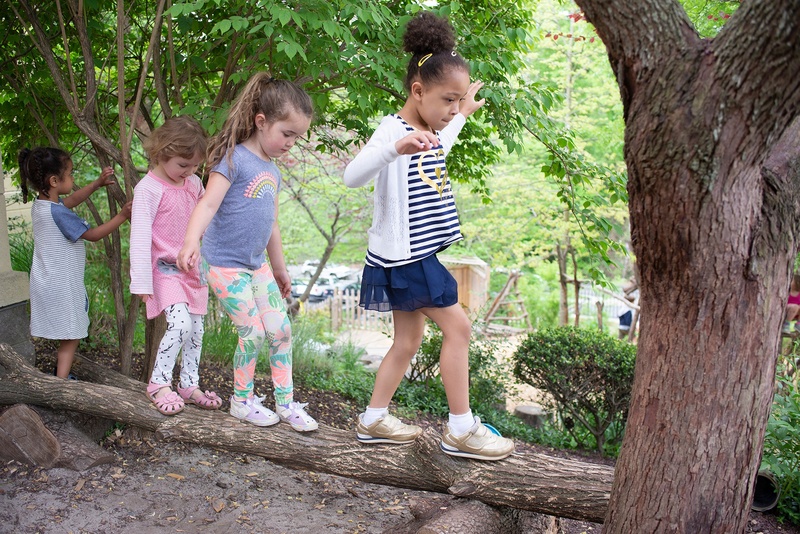 At Lowell, there are rules that reinforce safety, but children are allowed to climb trees, boulders, and logs on the playground. They build with loose branches and sticks, and they freely explore the outdoors. Because the school environment offers them freedom of movement and exploration, their creativity and imagination reach incredible heights of complexity and intricacy. They become pilots flying airplanes in the sky by setting logs in rows to signify the airplane seating chart. They use leaves for boarding tickets and rocks and sticks for the in-flight meal. Students are enamored with the natural world, science, and the animal kingdom, and many times I have seen all this knowledge transferred during playtime into wonderful adventures in which students enact with friends—for example, they become barn owls flying around to forage for food or blue tongue lizards walking around looking for bugs. This is when learning becomes meaningful and lasting. Play fosters and offers a rich vessel for imagination to blossom and grow. It is during the moments dedicated to play that children unveil the potential of their imaginations. The pretend play so vital to their development opens up horizons that are filled with adventure and fun. It is important to remind ourselves that play needs to be cherished as it holds the key for a successful and fulfilling future and most of all a purposeful present.